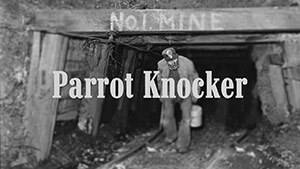 Despite the ongoing rumours about the fact that Vigg Strubble didn’t want to play the rock classic Parrot Knocker anymore (Newsflash #04 on page INS&OUTS) we proudly like to announce the re-release of this song. But in a totally different arrangement than before. After several emails, personal letters, pleasant encounters with fans and even fan art (see Fanmail in this site) Vigg Strubble re-considered his initial decision about “enough is enough” in regard to playing the rock classic year after year. Because, then again, the requests were tempting. So Vigg went back to the recording studio. Reminding all around him that it would be something else… Along with befriended studio musicians Vigg re-arranged Parrot Knocker into a ‘heavy slow rock song’, as he calls the new arrangement. Even some members of the earlier Canteen Girls took part in the backing vocals. So in the end: a completely different tune. And a bit of a reunion as well.